Spin Asymmetries of the Nucleon Experiment: an A rated experiment on the proton spin structure, took data in Spring 2009. Collaboration Membership(PDF format) (Names and affiliations as of end of run). Spokesmen: S.Choi , M. Jones, Z.-E. Meziani and O. Rondon (contact person). A SANE collaboration mailing list (sane@jlab.org) has been setup to send information about the experiment to the collaboration. Archive of the mailing list exists. Only the spokespersons and run coordinators will be able to send email to this list. The present ( as of Sept 16, 2008) list of email addresses. If you wish to join then send email to majordomo@jlab.org with " subscribe sane" in the body of the email. 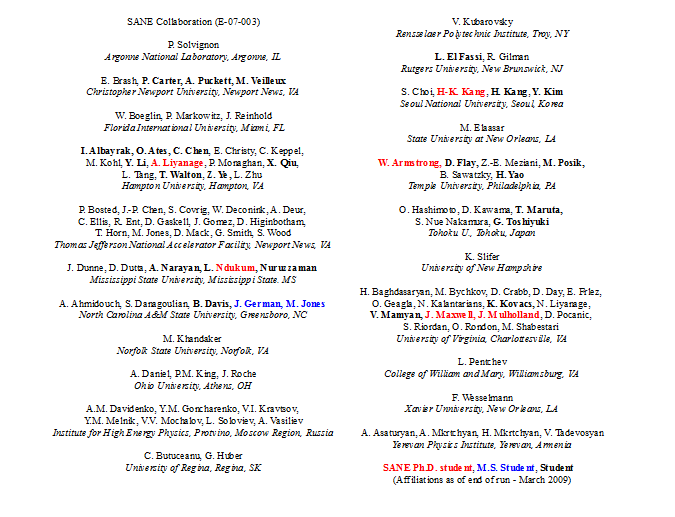 A SANE analysis mailing list has been setup (sane-analysis@jlab.org) to be a smaller list for discussing SANE. Archive of the mailing list exists. For this list everyone can send messages. The present ( as of Sept 16, 2008) list of email addresses. If you wish to join then send email to majordomo@jlab.org with " subscribe sane-analysis" in the body of the email. Wiki Page on the SANE long paper. The regular SANE analysis meeting will be Wednesday at 3:30 in F326/327. Attn. collaborators: If you are presenting a talk, please edit the agenda to link to your talk prior to the start of the meeting. For help doing this, click here or simply send the file to wikisysop and we'll post it for you. Connect by VNC to the UVa twist computer ( send email to bhovik@jlab.org for password). US: 1-866-740-1260 and the access code is 1150811#. There is a communal replay on octavian along with replayed runs and the log files from these runs. You can find information about that at this link here. (in two periods: from 1/30/09 to 2/8/09 6:00 AM and 2/26/09 to 3/4/09 6:00 AM). Sign Up for January-March 2009 Shifts. Updated mySQL files that can be searched using any mySQL installation. Short write up (postscript file) on how the Analyzer reads in the raw CODA data. Table of TRIGGER definitions. Table in another format: Triggers. Short write up on the BigCal coordinate system. HOW-TO participate remotely in SANE meetings. Draft of <math>SANE ~ HMS ~ resonances</math> paper H. Kang et al. Info on Octavian, where to find replayed runs, and some analysis info. Thanks to Steve Wood for installing this wiki for SANE. This page was last modified on 10 January 2018, at 15:02.